Just a quick post with my menu today. 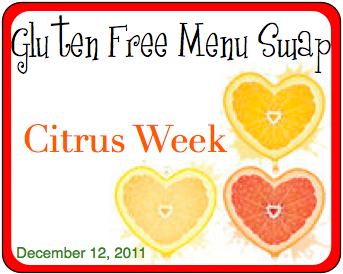 Cheryl of Gluten Free Goodness is the host for the Gluten Free Menu Swap today. She picked citrus for the theme ingredient. Yum! Still up in the air about what I am making for dinner… Do you got any good ideas for me? I think I will make something from another blog or from a cookbook. Something new and fun! This post will also be linked to Menu Plan Monday at Organized Junkie. And I thought my week was busy. Looks like you have me beat. lol. Love the sound of the Orange Beef Lettuce Wraps.